While battle ensued out in front with Ferrari and Mercedes going toe-to-toe for the victory, which was eventually claimed by Lewis Hamilton, Max Verstappen raced to a lonely fourth place, while Pierre Gasly picked up his first points for the Tilbrook team. Verstappen's race started in a whirlwind, dropping behind the Mercedes of Valtteri Bottas before collision with McLaren's Carlos Sainz Jnr who slammed the door on him at Turn 4, damaging the Spaniard, while Verstappen escaped unscathed. After circulating without much in front or behind him in fifth, Verstappen benefited when Hamilton's move on Sebastian Vettel saw the German pitched into a spin before he had to stop to replace his damaged front wing, promoting the Dutchman to fourth. 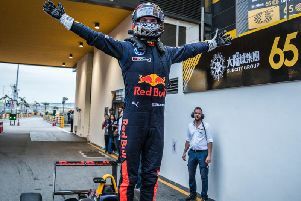 A problem for Charles Leclerc cost him a certain race win, but a late safety car prevented Verstappen from snatching a second consecutive podium finish. "I think we maximised the result today and it was another good point’s score," he said afterwards. "To finish fourth was not too bad as we struggled with pace and rear grip, especially with the high winds. I was sliding around a lot so it was not easy and I just had to manage it, but I don’t think we could have done a lot differently. I drove to the limit of the car, in Australia it was better but here it was pretty difficult. "We were almost on the podium today but it would have been down to luck as we didn’t have the true pace and really deserve it. Anyway, it was more unfortunate for Charles, but at least he’s still on the podium and I’m not too disappointed with fourth. While Gasly jumped five places after starting 13th on the grid to finish eighth, the Frenchman admitted he is still not at home in the RB15. He said: "It was quite a difficult race and I’m still not completely comfortable with the car. As soon as I try to push, I struggle a lot with the rear and the traction. For sure, I need to see what I can improve to get the maximum out of the car and work with the engineers to see what we can do to make me feel more confident, because at the moment I feel I cannot really push. "I need to make an effort and adapt, because each car is different, and I will work with the team to find a set-up which fits my driving style better. Overall, I think there are also some positives today. After the start the car felt better, I managed to finish inside the points, and now we just need to find the areas we can improve on."